My wife is a big fan of crosswords. Years ago I ran across a book with an unusual puzzle that was basically a crossword mixed with sodoku. The center of the puzzle was an empty grid, perhaps 6x6, with a few letters filled in. Around the outside of the grid were the beginnings and endings of words. The page looked like a nearly empty grid with letters to the left and right, above and below it. There were no clues given. Based just on the letters surrounding the grid an the few letters in the grid she had to figure out all the horizontal and vertical words. She really liked that book but I have never been able to find another book like it. Anybody know what that kind of puzzle is called or who makes it? You're looking for the gryptic! Not the answer you're looking for? 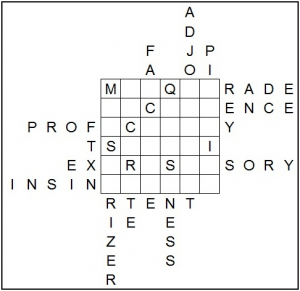 Browse other questions tagged crosswords puzzle-identification or ask your own question.